These claims do not appear to be founded on fact but appear to be simply propaganda; …the Shell claims are fiction, wishful thinking. Royal Dutch Shell, bound by its general business principles of honesty and integrity, casts these principles aside by simply fabricating stories re the health and safety risks of FLNG, as a means to an end. 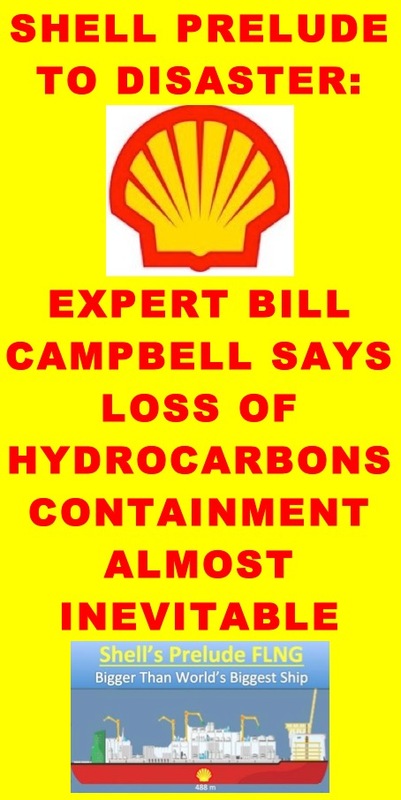 An article by Mr Bill Campbell, retired HSE Group Auditor, Shell International. In recent articles I challenged the unsubstantiated claims, with respect to the health and safety risks associated with FLNG, made by Shell on its websites. These claims do not appear to be founded on fact but appear to be simply propaganda. Shell would dearly wish that the risks of Prelude FLNG for example were quote on par with the risk levels of modern offshore installations, but this is a statement drawn from the ether, with no credible analysis to support it. The industry itself does not support the Shell euphoria with their more down to earth and sober assessment of the risks as we venture into the unknown by locating a hazardous substances plant on a vessel on the high sea for the first time. Reams and reams are published by Shell about the enormous size of the Prelude barge. I believe this is done purposefully by Shell to draw the readers attention away from the fact that the vessel deck area is woefully small to accommodate an LNG plant of the capacity planned. Shell say the Prelude LNG plant installed on the vessel deck on an area circa 9 acres would take up an area of 4 times this – or 36 acres – if build on land. But nowhere in the World is there an LNG plant, with its storage tanks and marine terminal occupying such a small area. The smallest plant proposed on land is 8 times the Prelude deck space and the average plant area of proposed and existing LNG plants of similar capacity to Prelude on land are some 20 times larger than the Prelude deck space. And what do Shell say about all this? As a shareholder I wrote to them on 20th September asking them simply on what basis did they conclude that the Prelude hull area was just a quarter of the size of a conventional onshore plant. Could they substantiate this claim? As yet no reply and I doubt if there ever will be. This is because the Shell claims are fiction, wishful thinking. The press releases are good script for the school of enthusiastic, but non technical journalists, who lap it up and spew it out. Again, here we have a current example of where Royal Dutch Shell, bound by its general business principles of honesty and integrity, casts these principles aside by simply fabricating stories re the health and safety risks of FLNG, as a means to an end. Apart from feeding false and unsupportable statements into the public domain, can we assume that the RDS Board members, particularly the non executive members, were also an audience for this propaganda positively influencing the Project approval decision? The more I think about it, the more I get concerned. This barge will be oscillating all the time and as a result all the pipework of the LNG plant will have to move along. This, if anything, does not reduce the number of leaks…. No doubt there are U bends to absorb the movements, also for temperature changes but still. All in a very tight and cramped place. Exactly as Bill Campbell has explained several times over. On land the chance for escalation is smaller (no movement, much bigger distances between the facilities and people can run away). In my opinion Bill Campbell is right about his risk assessment of the Prelude. If there is an accident (and sooner or later an accident will happen) the damage will be much larger than on a comparable site on shore. In my view an accident resulting in a fire is inevitable. Especially because the focus of Shell’s project department is on planning and budget. Taking shortcuts on quality and safety, including the violation of international standards is not a problem for the Shell top management. On a project like the Prelude the pressure on delivering on time will be enormous, this will effect the quality and therefore increase the risk. A second issue is operational errors leading to fires. The question is not if it will happen, but when it will happen. Just analyse the number of fires on a on- shore Shell site! Keep in mind that the real number will be higher, because Shell is doing it’s utmost best to hide and downplay any kind of negative publicity. Posted in: Bill Campbell, Business Principles, Gas, LNG, Prelude FLNG Project, Royal Dutch Shell Plc.